“Terrible. Shambolic. Corrupt.” | Come Here To Me! The word cloud above is a pretty shocking indictment of the state of Association Football in Ireland, and is taken from the Supporters Direct European Fans’ Survey report on the beautiful game in Ireland. 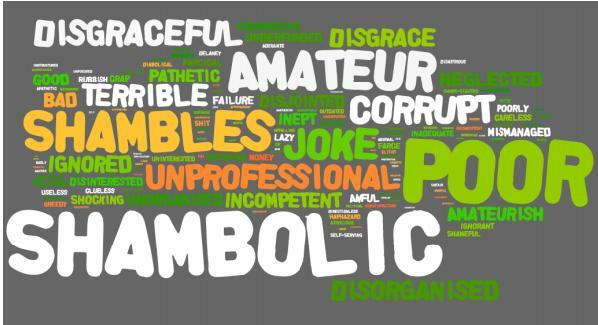 Supporters were asked to give two words they felt described the running of the sport here in Ireland. Some 1,509 Irish fans took part in the survey, with almost half of these coming from Shamrock Rovers and Cork City. The report is available to read in full here. The bigger the word appears above, the more often it was listed. Last weekend, fans from around the country met in Cork to discuss the state of the game in Ireland and the campaign to build a real Supporters Trust here. A message of support was read from President Michael D. Higgins, and in addition to Irish clubs there were fans and representatives from AFC Wimbledon, FC United of Manchester and others in attendance. Our friends over at The True Ball have written up a report on the conference which I’d recommend reading if you’re a League of Ireland supporter, casually or religiously! It is evident from this report that a desire to see the League of Ireland survive in a long-term sustainable fashion is foremost in fans’ minds, hardly surprising given the clubs that have come and gone in recent years. The distrust of the FAI is also evident. But so too is the sense that, certain barriers aside, these objectives are achievable and more importantly, desirable. 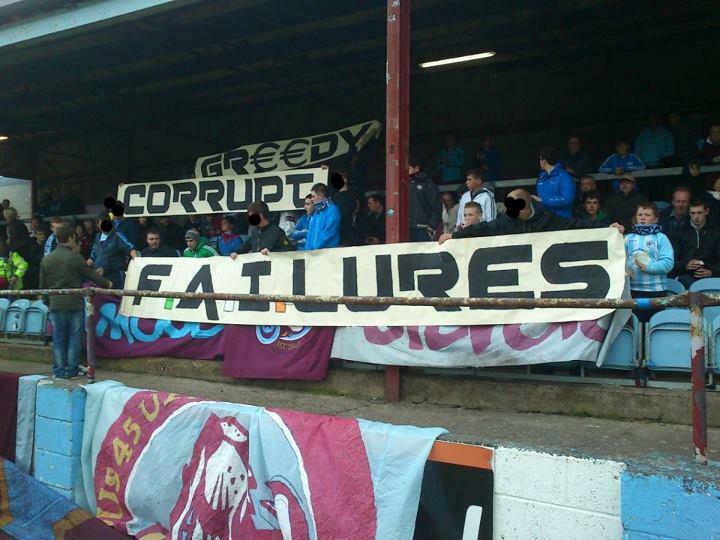 Drogheda United fans earlier this season.